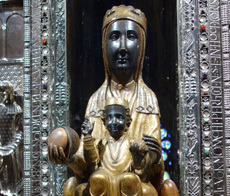 The figure of the Mother of God of Montserrat is part of an imaginary comprising numerous legends, myths, resignifications (and subversions), uses and beliefs. 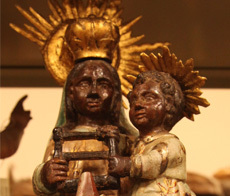 The mystical and folkloric world that has surrounded the icon of La Moreneta means her image goes beyond the limits of a purely Catholic cult dedicated to Mary, and has become a patrimonial symbol of popular and official Catalan culture, closely related to its history of migration and resistance. The local myths surrounding the finding of the statue in the 9th century, or legends such as that of Cavall Bernat [Bernat the horse] or the Timbaler del Bruc [the Drummer of El Bruc], among others, have afforded her a protective social role that led to her being honoured as the patron saint of Catalonia in 1881. In parallel, during this century, several Catalan migrations towards Latin America took place, mainly to the Caribbean-Antilles and Rio de la Plata zones (Buenos Aires – Montevideo). Towards the end of the 1970s a new radically different migratory flow began, mainly of Claretian missionaries from the central regions to the recently administered territories of Spanish Guinea. 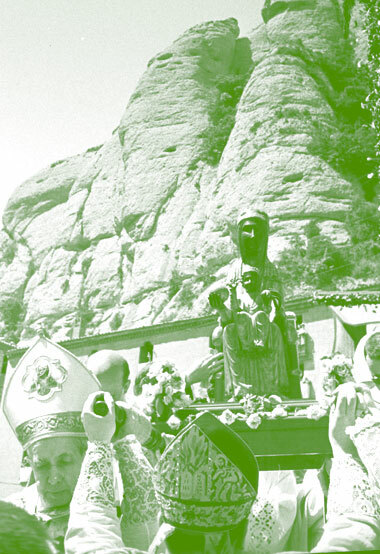 The arrival of the 20th century diversified the uses and legends surrounding the Virgin of Montserrat even more. Replicas and new places of worship appeared in other regions, as well as original myths –such as that of the Third Reich’s quest for the Holy Grail–. In periods of conflict, such as the revolutionary uprisings of the Tragic Week and the Civil War, the image was either protected or destroyed. Later on, the image has been sacralised in the world of football and sectors of left-wing independentism have made a subversive and almost iconoclastic use of the image. With globalisation and the arrival of mass tourism in recent decades, the use of the image of the black virgin and its sacred space has also been transformed. 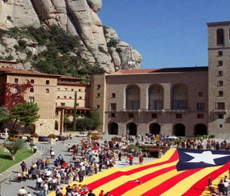 Both are now partially commercialised and exploited for financial purposes, something that leaves the door open to new constructions of the local in the global world, with large-scale reproductions beyond the patrimonial significance of the Catalan sphere.